from the control of the Philistines. 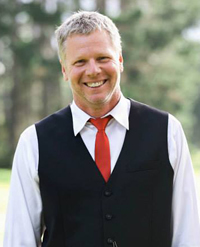 David also defeated the Moabites. He made them lie down on the ground and measured them off with a length of cord. Every two lengths of them were put to death, and the third length was allowed to live. And David became famous after he returned from striking down eighteen thousand Edomites in the Valley of Salt. He put garrisons throughout Edom, and all the Edomites became subject to David. The Lord gave David victory wherever he went." WEST: Under David’s leadership Israel defeated the Philistines after 125 years of continual conflicts. This is an amazing turn around since at the time of Saul’s death the Philistines had completely overrun the northern tribes of Israel. But, now under David, the Philistines had been subdued. EAST: In Moab David executed 2 out of every 3 of their captive soldiers by measuring with a tape measure (or “a length of cord”) two groups to be killed as they lay on the ground and one group to return home in order to pay tribute to Israel. This seems rather cruel since David’s great-grandmother Ruth was a Moabite (Ruth 4:5 and 4:21-22) and the king of Moab protected David’s family (1 Sam. 22:3) while Saul was hunting David as a fugitive. Something must have gone very wrong between Moab and Israel’s international relationship. Or, was David acting in mercy by allowing 1 out of every 3 Moabite soldiers to live? And, to live unmutilated! In this ancient world prisoners of war were tortured and killed or, if allowed to live, they would be mutilated by being blinded or having fingers or toes cut off to incapacitate them from being a future threat. NORTH: Historically the city-states of Aram united during the same time that the twelve tribes of Israel united under King Saul and King David. But, once while the Aramean King Hadadezer was conducting a military campaign near the Euphrates River to the north, David invaded Aram from the south near the area of Dan in northern Israel. Things went very bad for the Arameans when troops from Damascus were dispatched to engage David’s troops in the south in an attempt to assist Hadadezer who was preoccupied in the north. 22,000 of those Aramean troops where struck down and David stationed Israeli troops in garrisons all the way up into the territory around Damascus. The Arameans then paid tribute to David. SOUTH: David even established garrisons in the territory south of Judah in the land of Edom. The text of 8:14 makes a very emphatic statement that literally reads: David “put in Edom garrisons, in all Edom he put garrisons.” From this expansion of land controlled by Israel that now extended to the major trade route city of Damascus in the north to the caravan routes in the south through Edom, known as the Spice Routes, David had not only taken control of the military, but had also set Israel up to receive a tremendous economic boost from the northern and southern trade routes that ran into, through and around the land of Israel. Francis of Assisi, Italy was a wealthy cloth merchant. Francis had been captured in war and held prisoner for a year before he was released. In 1206 Francis was drawn by a desire to care for the poor because of his faith. He gave all he had to the poor, lived a life of poverty and began to ask others for money to help the poor. Francis preached around Assisi in Italy and gained a following of 3,000 people. Together they received the papal approval for the Franciscan order of monks in 1218. 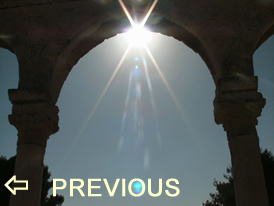 Parousia (Gr) – coming (Eng) – parousia is Greek word that literally means “a presence.” Parousia is made from para, meaning “with” and ousia, meaning “being.” When parousia is used in the papyri it refers to an arrival of an individual to a location and their presence. Parousia is used of Jesus on Mt. Hermon during the transfiguration (2 Peter 1:16). Parousia is also used in: Matt. 24:3, 37; 1 Cor. 15:23; 1 Thes. 3:13; 4:15; 5:23; 2 Thes. 2:1; James 5:7-8; 2 Peter 3:4; 1 John 2:28. 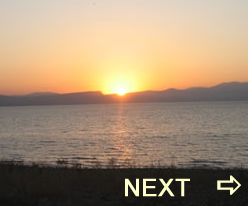 (1) the southern third of the Dead Sea sits on the Great Rift Valley which is a large fault line in the earth’s crust. (2) This area of the Dead Sea is still the source of natural gas, sulfur, salt and other mineral deposits. One theory presents the idea that the Great Rift Valley opened because of an earthquake and natural gases were released and ignited by the cities lamps. A second new theory says that the cities were built on the sand, but when an earthquake released the underground water the city floated for a while on the floating sand, but as the gases exploded the cities were covered with fallout and sank into the vacuum created by the escaping water. In both theories Sodom and Gomorrah is at the bottom of the shallow southern third of the Dead Sea which had previously been a fertile plain. Do I appreciate the peace and prosperity I experience in my life, my community, my nation? and nothing you desire can compare with her." 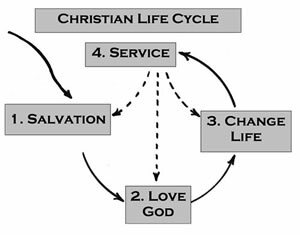 A simple life cycle for the Christian's life in time. This is cave number 4 of the eleven caves that were found with scrolls. 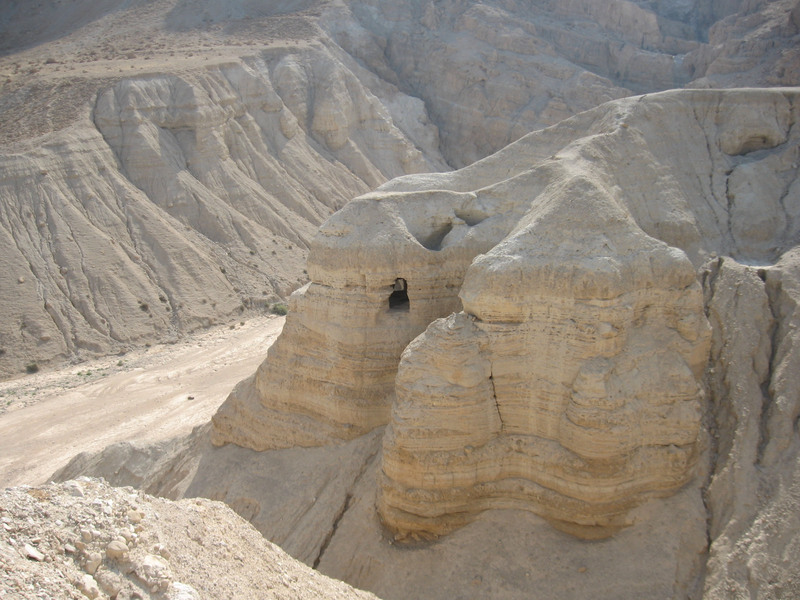 Fragments of over 550 manuscripts were found in this cave. These and other manuscripts became known to us as the Dead Sea Scrolls.